Oh goodness, I think I'm in love. Date? Hmmmm Cat dating? What would the other fellow say? Purr, kitty dating sounds like a lot of fun. 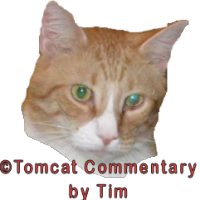 Thanks so much for the wonderful compliment, Mr.Tomcat, I'm honored to have received it from such a marvelous cat. 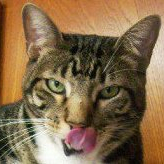 Toby Tomcat, you truly are a cat's cat... handsome, sleek, debonair, charming... you've got it all Toby, you really do. Oh My Catness! I thought the end of the thread was before the advertisement! And here it's now following it as well. I feel like a dork! Asteroid! You are a beautiful orangie with a terrific page... it's obvious you are truly loved. And if you would kindly forgive me for writing about Toby instead of you, I'll be your devoted fan forever. PS. Is it me, or is the new Catster loaded with more advertising than before?? Happy Happy Purr Purr Buds with Asteroid! Like a lovely clear night of wonder. PS Yeah... Whats up with the adds already? Pop is wishing he was 20 sumptin. Me-|^|-ow! If I was Tall-Stander I would be, well, maybe early 20\'s. No one knows my real birthday so we guess. It was a good thing being adopted. I wish all a very nice holiday and remember those who have made our lives safe and secure! Purrs and pets. :^: Oh lots of treats for |:| everyone! Zeus the Meezer is surely a pleaser! Lovely markings and I am sure you got a big personality too! Lucy Belle is a beautiful tabby with cute white socks! She is very photogenic and has such a sweet face! K.C. is very regal looking.